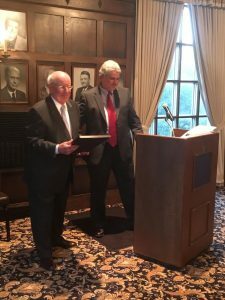 On September 12, 2016, Justice Paul Pfeifer, completing his third full term as a justice of the Ohio Supreme Court, spoke to the membership of the Miami Valley Trial Lawyers Association at the Dayton Engineers Club. Justice Pfeifer advised the gathered lawyers to “remember the ideals that made you become a lawyer”. He reminded us to “take time to yourself” to think about your career and your profession. If we take time to reflect, Justice Pfeifer suggested that, “I wager everyone would say I made a good choice and I would do it again in a heartbeat” concerning the career choice of being a lawyer. Justice Pfeifer indicated when he was asked to run for the Ohio Supreme Court, he really did not want to do it. After being elected, he stated “I immediately loved it” however. He said his biggest disappointment on the Supreme Court was the upholding of damage caps in the Arbino decision (Arbino v. Johnson & Johnson, 116 Ohio St.3d 468, 2007-Ohio-6948). He was upset that Justices who had struck down “tort reform” in the past nonetheless approved it this time around. Recalling the first effort of tort reform, in the Sheward case (State ex rel. Ohio Academy of Trial Lawyers v. Sheward, 86 Ohio St.3d 451, 1999-Ohio-123), the dissenters “did not meet us head-on”. He indicated they did not contest the merits, but simply created a “hullabaloo” over how the decision came before the Court on an expedited basis. Justice Pfeifer stated that he thinks it was critical to get the case before the Court to give an indication as to what the prospective law will be, adding that in the Arbino case something similar was done. 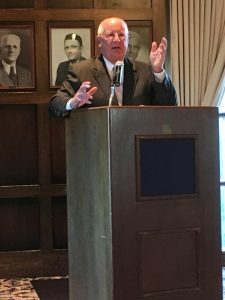 In an interview with Mary Anne Sharkey of the Cleveland Plain Dealer, he had said something to the effect that it was a powerful thing to be on the Court, in comparison to the difficulties of getting legislation approved. He was quoted as saying “count to four and it’s over”, which he says he never said, but which was widely interpreted as an endorsement of judicial activism resulting from simply having four of the seven justices on your side. Yet he agrees that it is the role of the Court to be flexible and to “advance the common law as new issues arise”. Justice Pfeifer said that the “jury system is the greatest and most fundamental part of our democracy”. He admonished us to “never forget [that] the jury system is democracy in action.” He said that we are all engaged in a constant battle to fend off attacks on the jury system. great admirer of Bill Saxbe (William “Bill” Saxbe ( June 24, 1916 – August 24, 2010) who served as a U.S. Senator for Ohio, and was the Attorney General for Presidents Richard M. Nixon and Gerald R. Ford, and as the U.S. Ambassador to India), who was a “practical common-sense” attorney general, who remembered he came from Mechanicsburg, Ohio. In response to a question as to his position on merit selection, he said he did not necessarily approve of it because we have seen too many examples of judges not having an opponent to run against and yet being voted out of office. He essentially sees it as a method of attacking a judge or justice for making honest decisions. He said we have to rely on the “political parties, which have to work hard to get good candidates.” He said that with the results in the U.S. Supreme Court in Citizens United (Citizens United v. Federal Election Commission, 558 U.S. 310 (2010)), the political system was overwhelmed by money, which was a bad thing. He pointed out that no one on the United States Supreme Court had ever run for anything as a politician and opined that many had “unrealistic ideas” about how politics and democracy work. Finally, he reminded us, “don’t forget your clients”. He told us “you can help people… that’s what this business is all about.” Sometimes the best way to help a client is to tell him, “you have been harmed but taking this further is not a good thing. Go home and get on with your life.” He said that this was something “very hard for lawyers to do”. 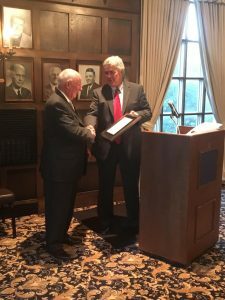 Justice Pfeifer to make his remarks, was presented in person with the MVTLA Gounaris Judicial Award. When it was handed it to him, he said “I will treasure this”. A great man. A giant on whose shoulders we stand.